A few streets north of Arco della Pace is the centre of Chinatown, in Via Paolo Sarpi. The first Chinese immigrants settled here at the end of world war two, opening mainly fabric and then leather shops, but in recent years there has been a large increase in commerce of all kinds. 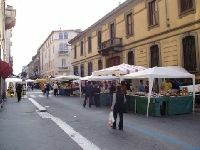 The city’s attempts to move some of the shops out to less congested areas of the city were met with violent street protests in spring 2007, and the death of two young people in a gang war shoot-out close to Via Paolo Sarpi in April 2007 has alarmed the city. Presently, city authorities are brokering a deal with the Chinese community to transfer all wholesale shops to the outer city limits, in an area where the Alfa Romeo factory used to be.